Native Instrument’s Audio Kontrol Interface allows for capturing microphones, guitars, and many other things to be used in your computer. 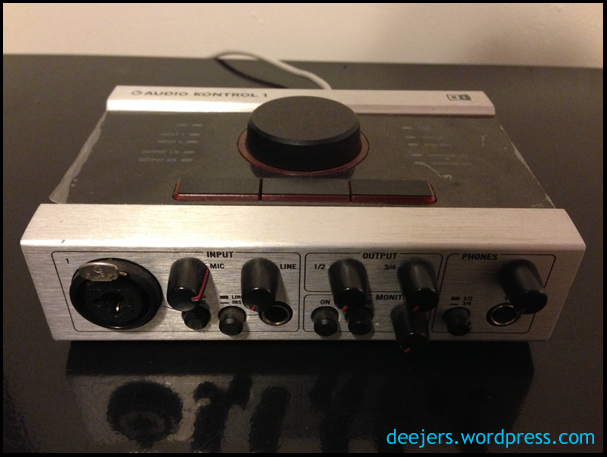 An audio interface is the first step and the most important part of building a digital studio. 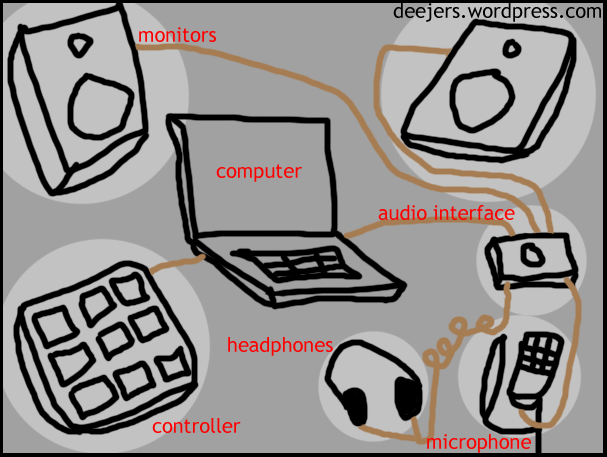 The interface is where a guitar, microphone, or any other audio source meets the digital realm and is converted into streams of bits that a computer can work with. This is also where a digital audio source will be converted back into analog when you want playback through speakers or a set of headphones. An audio interface’s job, in a nutshell, is to help you move quickly and seamlessly between digital and analog audio and is a key component to producing music electronically. 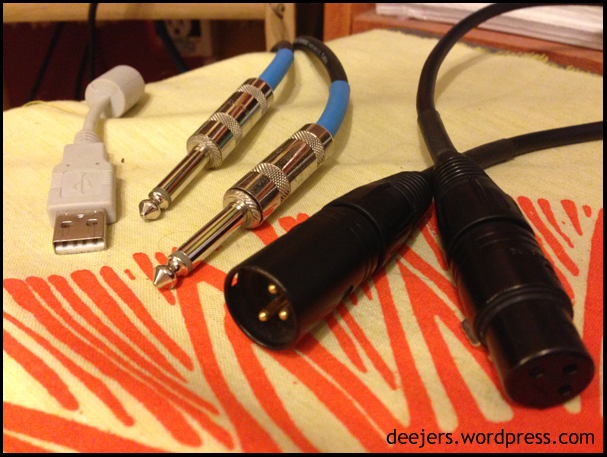 Three types of audio cables – USB, TS, and XLR (shown left to right) will connect many devices to your audio interface or computer. If a DAW is the heart of the studio, then the cables are definitely the veins and arteries carrying sound signals to and fro. Quarter-inch (1/4”), unbalanced TS cables (“Tip-Sleeve”) are the standard, and they are the normal guitar cables that you see everywhere that can hook up to almost anything. There are also balanced TRS cables (“Tip-Ring-Sleeve”) for running mono signals (Mono vs. Stereo) that are generally more expensive, but will help combat interference and extra noise from being added to your signals. In some cases, RCA cables (the ones with the multi-colored hookups) can be used but are not the norm. XLR is another common type of cable, although microphones are usually the only major device that utilizes this type as a means of communication. USB is becoming more trusted as well, and it has an advantage because it can hook up directly to the computer without the need for an interface. So in short, TRS cables will almost always be needed, but depending on the devices you are using you might have to get some others. It’s a good idea to start building a collection of various cables and converters that will save you some frustration later if they’re needed. Sony’s MDR-V6 Headphones provide excellent sound reference for your productions with an over-the-ear design. Headphones will act as your ears’ main connection to your computer, so it is important to invest in a quality pair. It isn’t a good idea to use in-ear phones for many reasons (low quality, leaking noise, etc. ), so getting a pair that has cushions and covers your entire ear is the best choice. 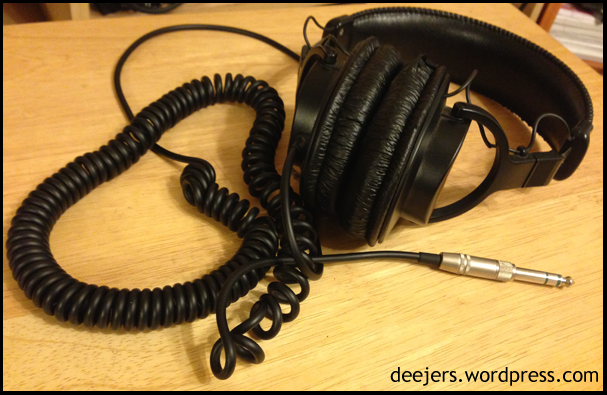 It is extremely important to look for “studio” or “monitor” headphones, and be wary of Beats by Dre or other Hi-Fi headphone brands – they embellish audio signals and won’t provide you with an accurate depiction of the sounds you are creating. This KRK Rokit is an example of a reference monitor that will help you hear how your music behaves in space and at high volumes. 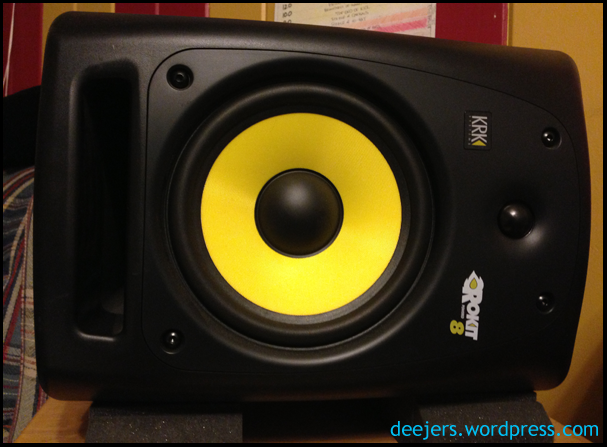 “Reference Monitors” is the term for speakers that are used in studios and for music production. They are different from average speakers in the same way that studio headphones are from Beats; they output a pure representation of what is input, without any embellishing or equalizing for better quality. Headphones are excellent for hearing all the details of your productions, but monitors will allow you to hear how they sound out in the open and in space. Most songs are meant to be played through speakers at some point, so knowing what your music sounds like when it is played out loud is very important. 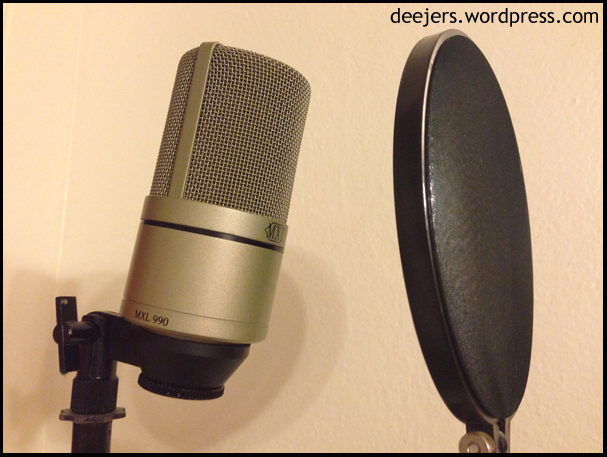 An example of an affordable microphone – the MXL 990, shown here with a pop filter. A microphone will allow you to put sounds directly into your computer, whether it is your voice, an acoustic instrument, or any other source of sound. There are a few major types of mic’s that are used for recording music, including cardioid, dynamic, condenser, and ribbon microphones, but dynamic and condenser are the most commonly used and available. A dynamic mic is one that is generally used for performing live because of its stability and durability, while a condenser mic is more fragile and commonly used for recording in professional studios. It is important to note, as I have recently learned, that each type of microphone can be used for recording depending on how you want to utilize the existing strengths and weaknesses. Each type of microphone has its own unique characteristics that will process sound and add certain qualities to it, so finding the right microphone for the job can be an art. Trying as many microphones as you can get your hands will help you find what works best for you and helps shape the sound that you’d like to make. Depending on what type of music you are interested in creating, a microphone may not be necessary, but it can still be a useful tool for adding small elements to your music. Some professional-quality microphones can go into the thousands of dollars, but there are also kinds that can be bought for less than $100 and are still high-quality (some even connect through USB and don’t need an audio interface/mixer). 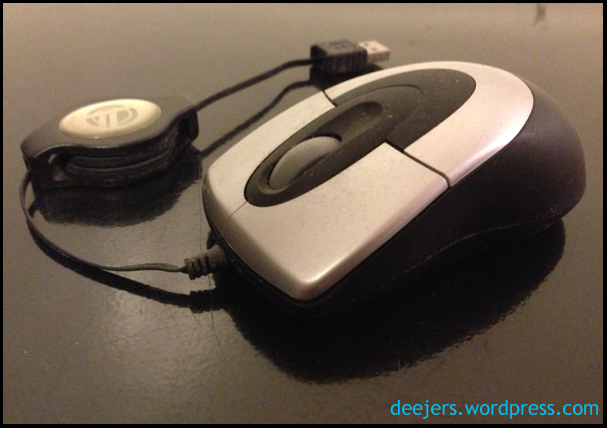 A USB mouse can easily be attached to a laptop and will make working within your software much easier. 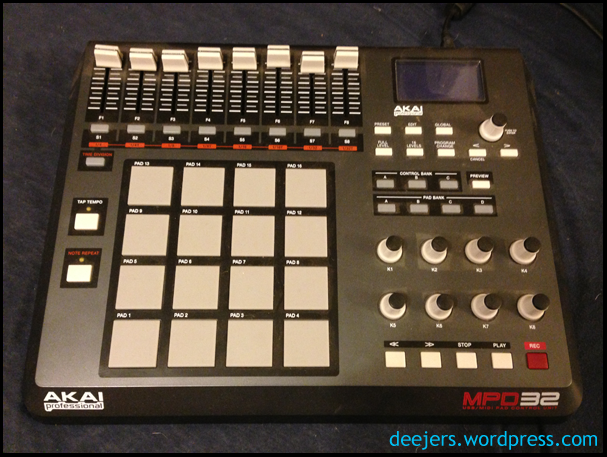 Akai’s MPD32, one of many controllers that exist for creating electronic music. Controllers are not a necessary part of a digital studio; they don’t deal with any of the audio signal and don’t provide much functionality that won’t already exist. However, the reason controllers are important is because they help streamline the process of creating music on a computer. Instead of searching for the “play” icon every time you want to get playback, you can press a single button on a controller to do this. Controllers can remove you from the screen and keyboard perspective that quickly becomes dull and uninspiring, and can help free your hands and imagination. 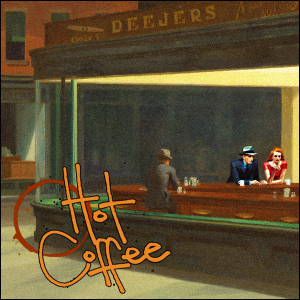 A controller, in many cases, is the real instrument in a digital rig and some musicians can do amazing things with them. There is a tremendous variety of controllers available today, and I’d really like to dive into the various options in an upcoming blog post. Here’s a quick sketch of a simple digital studio (wire connections are drawn in tan). These are just the basic components of a digital studio environment, and a lot of other various devices can be added into the mix. Like I said in my last post about DAWs, its all about finding what you need, what best suits you, and what helps you get your ideas onto the computer as fluently as possible. Once you find the right combination for your creative process, you might be amazed at how fun and easy it is to make music with your computer. Now get things moving!